Rough week here in the “D,” losing Max Scherzer to the Washington Nationals. It’s bad enough they fleeced us on the Doug Fister deal a year ago, now they are just getting greedy. I’m especially sad to see him go, because aside from being a Cy Young Award pitcher, he was a fellow Mizzou guy. Oh well, sounds like the perfect excuse to go and drink the troubles away. And there are increasingly more and more places to partake of the finer things (namely whiskey) as the “bourbon boom” continues. Here in Detroit, we have become home to several start-up distilleries. In the next couple weeks, I’ll discuss them – and their corresponding tasting rooms – at greater length. This week, I ventured to one of the hipper new distilleries – the Detroit City Distillery. The Detroit City Distillery opened last year in Detroit’s historic Eastern Market. Only the second licensed distillery to open in Detroit in 80 years (the first was Two James, which we will discuss soon), it was the brain child of a group of close friends with a passion for booze and urban revitalization. They began by distilling their own vodka and whiskey, as well as preparing for gin, which will be out ‘soon.’ But what about bourbon? Bourbon is one of the trickier offerings for any start-up distillery. There are laws and rules regulation how bourbon has to be prepared, aged and bottled. I won’t break them all down here (a good explanation can be found here), but the hardest one is the aging. 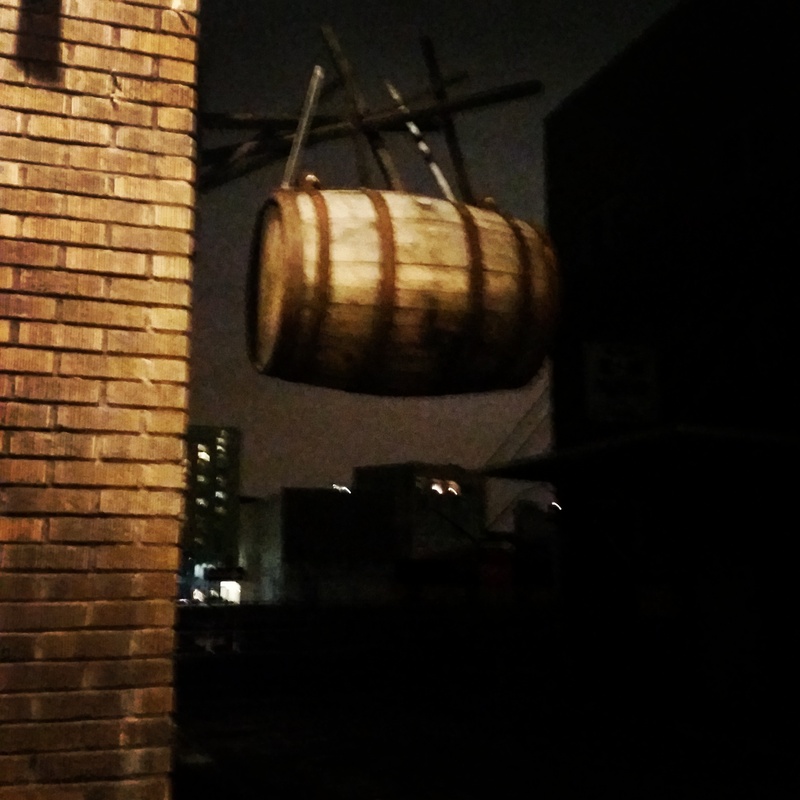 For a bourbon to be called “straight bourbon,” it has to have spent at least two years in the barrel. If it’s younger than four years, it must have an age statement on the bottle. So to make bourbon, a new distillery has to sink the money into storage, and barrels, grains and equipment and…wait. There are, of course, ways around this. The most popular way is to “source” bourbon, buying from another (often mass quantity produced) distiller and bottle/label it with the new brand name. Many of the newer distilleries in Michigan are doing this, and Detroit City Distillery is too – sort of. For their Two-Faced Bourbon, DCD is taking a five year old sourced bourbon and blending it with their own very young (6 month old) house made bourbon, in a 51%-49% mix – hence the name “Two Faced.” Since their bourbon is locally sourced (including corn from St. Clair County here in Michigan), it is truly reflective of their own recipe (which is high in rye), but has some of the age of an older bourbon. DCD is very open about this process, unlike other distilleries that are sourcing and a little less forthcoming about it. And stopping into their speakeasy style tasting room in Eastern Market, one needs only look at their artisan cocktail list to see they are trying to do something both retro and inventive, with a great deal of respect paid to the craftsmanship. With my good friend Eric Oliver joining me, we sat down at the bar to try the bourbon, as well as a few other drinks. The long bar is impressive – it is made of reclaimed wood from another Detroit building – and the soft lighting and exposed beams set a nice ambiance. Glasses were poured, toasts were made, bourbon was consumed. Right from the nose, this dog has some bite. While only 94 proof, the first scent was hot, almost like a high-proof rye would be. Given a minute, the heat started to part and opened to an unsurprising corn and spice. There were hints of almond and a touch of toffee, but the prevailing smell was corn. The taste was softer than I expected. Fiery on the front, the bourbon has those high-rye pepper notes, with a touch of cinnamon and allspice, but the younger corn seemed to temper it well. Nutmeg and a slight bitter – almost coffee – were present. It had a thin mouth feel, almost watery, but that works to it’s advantage – thicker would cause the spice to linger too long. There was a soft sweetness as well, part corn and part caramel. The finish was hot but not lingering. There was a pepper to the finish, and it was the first time I detected a touch of oak. Most of all, there was that ever-present corn, soft and subtle. The recipe for Detroit City Distillery Two-Faced Bourbon seems good – it was not overly simple, and blended nicely with the older sourced bourbon. As a sipping whiskey, it could use more aging to add complexity and depth. As a main ingredient in some of the totally unique cocktails they are preparing at their tasting room, it works very very nicely. 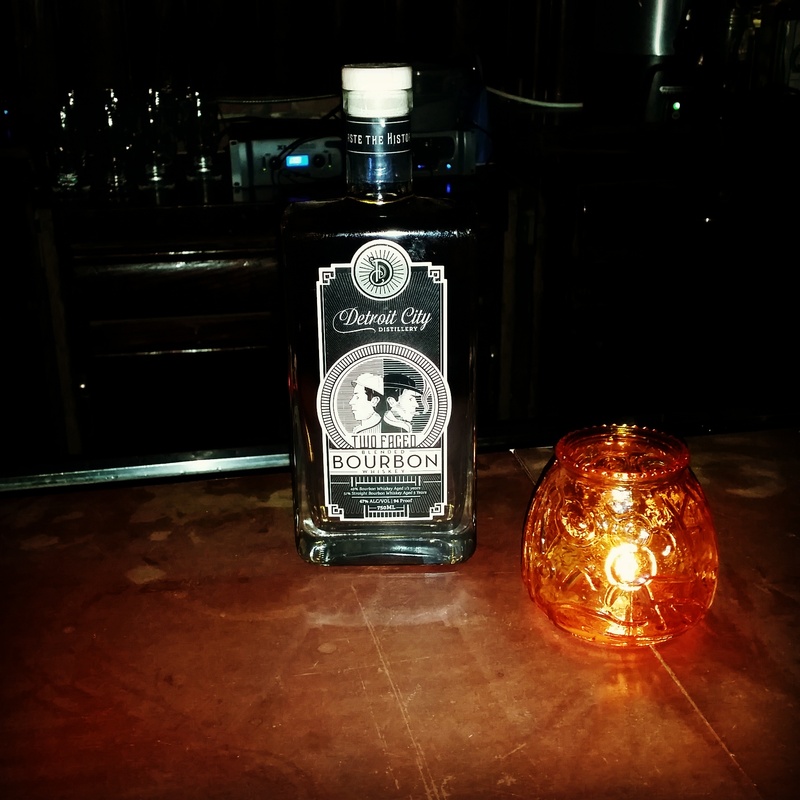 Detroit City Distillery Two-Faced Bourbon is not yet available at distributors, but will be soon. The price point – like most micro-distillers – is still on the higher side ($50 for 750mL), but there is something to be said for buying local now, isn’t there. And the Tasting Room is well worth a visit!